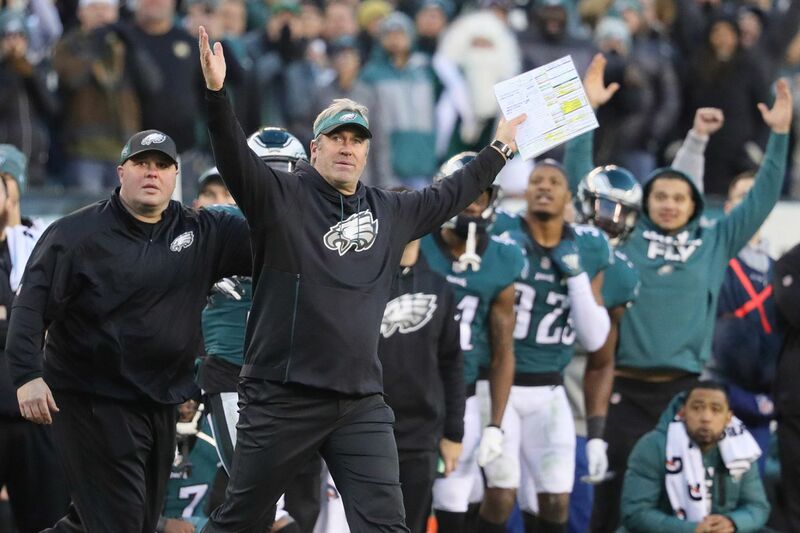 Eagles head coach Doug Pederson, right, celebrates the game-winning field goal over the Texans. Philadelphia Eagles win 32-30 over the Houston Texans in Philadelphia, PA on December 23, 2018. The Eagles will travel to Washington Sunday afternoon with their playoff hopes on the line. Our four beat writers predict the outcome. I like the Eagles to hold up their end of their playoff-making scenario; I’m way less certain about the Bears beating the Vikings. But this Eagles team ought to finish with a winning record, and on a strong run. Despite some wobbles it has come together well since that embarrassing loss at New Orleans Nov. 18. If the NFL could’ve figured out a fumble recovery correctly, the Eagles could he heading into this matchup on a five-game winning streak. And yeah, they waited too long to do it, they were capable of this level of play earlier, despite the injuries. Josh Johnson might give Washington better quarterbacking Sunday than it got from Colt McCoy and Mark Sanchez in the last meeting with the Eagles, but I really don’t see him as a game-changer. What you want to do is establish control early, make the Redskins start thinking about going on vacation. Prediction: Eagles 25, Redskins 16. Trust me. The Eagles have this one. I know, I know. I haven’t exactly had my finger on the pulse of this team this year when it’s come to predicting wins and losses. But take this one to the bank. Yeah, sure, they once lost to Joe Webb. But they’re not going to lose to Josh Johnson. No way. No how. The Redskins are going to run the ball Sunday. A lot. They’ve run it 67 times in Johnson’s two starts. They’ve run it on 38 of 49 first-down plays in those two games. The Eagles finally seem to have stabilized that aspect of their defense. Held Houston’s running backs to 13 yards on 11 carries last week. Did good jobs in the second half against the Rams’ Todd Gurley and the Cowboys’ Ezekiel Elliott. Johnson also can run, which is going to pose some challenges for the Eagles’ pass rush. But we’re talking about a guy who had been out of football for four years before the Redskins signed him last month. He’s got a 75.3 passer rating in his two starts and is averaging 6.3 yards per attempt in those two games. I don’t think the Eagles are going to make the playoffs, but it will be because of a Vikings victory over the Bears Sunday, not because of an Eagles loss to Redskins. The Eagles are peaking at the right time even if they’re down to backup quarterback Nick Foles and several other reserves throughout the lineup. They’ve played light and loose the last two weeks and again have nothing to lose Sunday in Landover – except, of course, that whole not making the playoffs thing. The beat-up Redskins showed some heart two weeks ago in beating the Jaguars, but they’ve lost five of their last six. Quarterback Josh Johnson has taken over for Mark Sanchez, who took over for Colt McCoy, who took over for Alex Smith. Sanchez isn’t injured, unlike the latter two. He’s just not very good. Johnson can run if necessary, but he’s a below-average thrower and his best receiving option – tight end Jordan Reed -- went on IR Thursday. Adrian Peterson proved to many this season that he still had tread on the tires, but aside from a 90-yard touchdown run against the Eagles earlier this month, he was kept in check at the Linc. If Washington is to have a shot, they’ll likely need a standout performance from their defensive line. Eagles left tackle Jason Peters is expected to start after missing most of last week’s game with a quadriceps strain, but Halapoulivaati Vaitai is one tweak from getting tossed back onto the field. He won’t have to worry about linebacker Ryan Kerrigan much. Kerrigan will mostly be right tackle Lane Johnson’s responsibility. But Vaitai has struggled in spot duty. It says here that the Eagles hold up their end, but they need the Bears to knock off the Vikings to claim the last spot in the postseason. It may not be enough. I liked the Eagles in the first Washington game, and the Eagles have improved since then and Washington has regressed. So I’m not overthinking it; this is an Eagles win. I don’t see Nick Foles racking up 471 yards again, but this will be another good performance by Foles. Washington has the 14th-ranked passing defense, although they just cut top safety D.J. Swearinger this week. Watch out for another big game by Zach Ertz, who had nine catches against Washington earlier this month. On the other side of the ball, Washington’s Josh Johnson has stepped in at quarterback, but injuries all around him limit Washington’s offense. They put Jordan Reed on injured reserve this week and their offensive line is decimated. The Eagles held Washington to 13 points in the first game, and I don’t see this one being much different. Look for the Eagles to cruise to a win. However, I think Minnesota beats Chicago and the Eagles’ season ends with five wins in six games, but no postseason to show for it.